Of all my gardens, my family's favorite are the shade gardens. Calm, peaceful and truly easy care, they are my favorite, too. 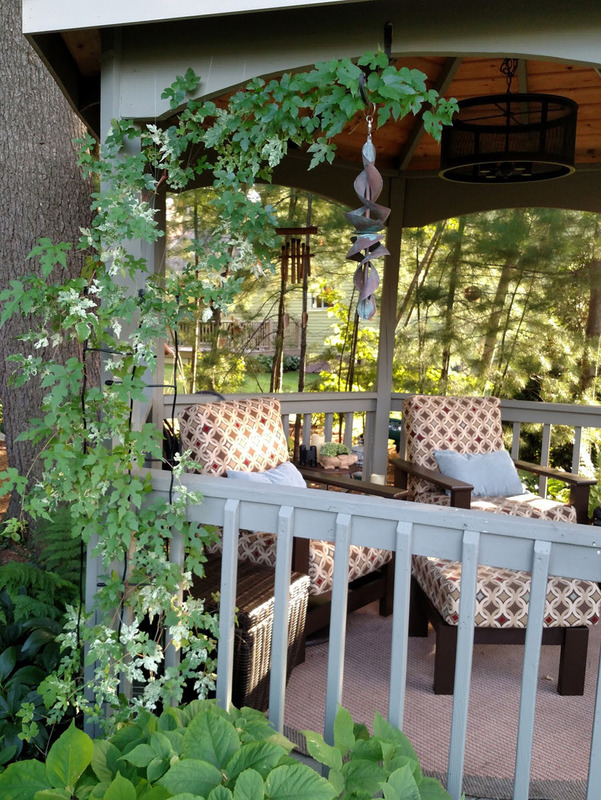 The bulk of our outdoor living is centered in the backyard which includes a stone patio, gazebo and garden shed. 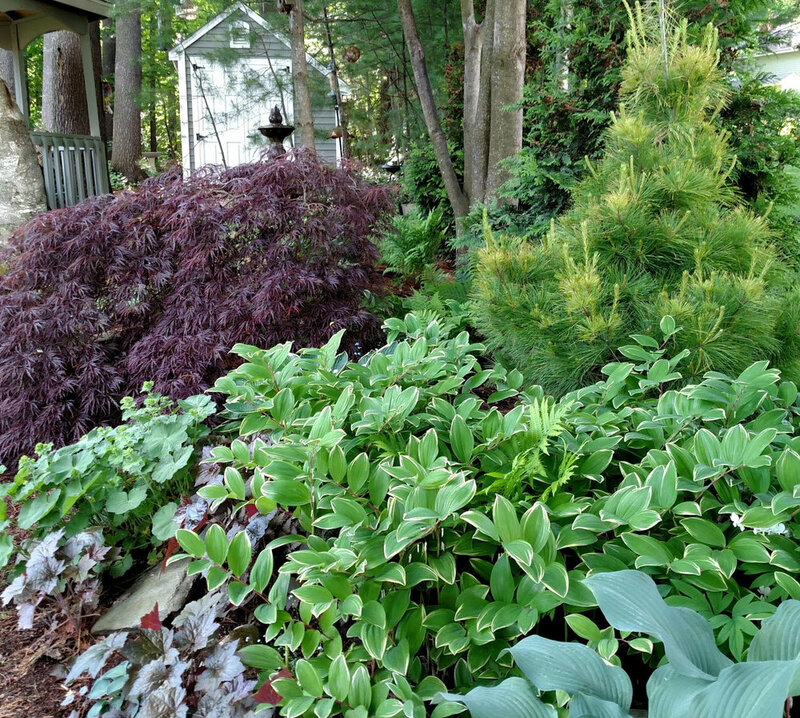 All of which are softened by the surrounding plantings. 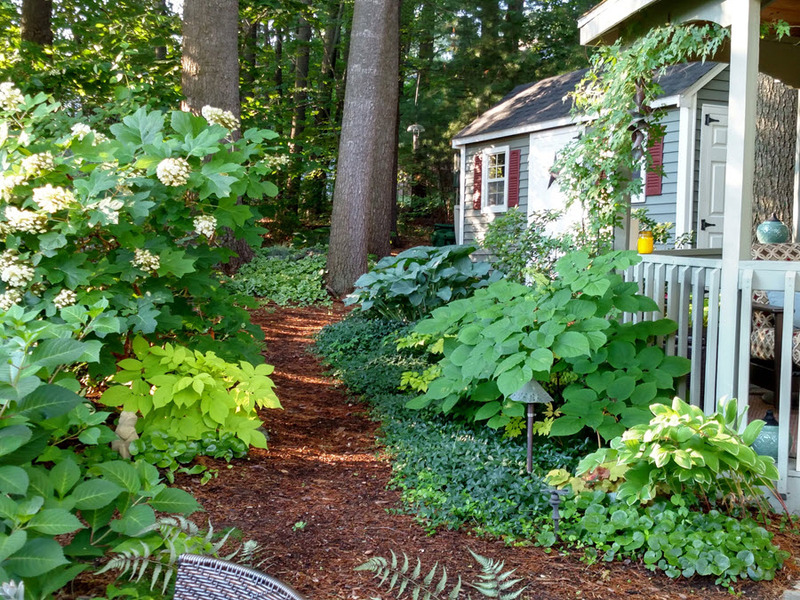 Photo gallery of shade garden follows below. Plants are chosen for their tolerance of dry conditions, requiring minimal care throughout the seasons. The tall pines, birch and maple trees all provide dappled shade and protection from the hot southern sun. While some neighbors are fleeing to their air conditioned homes, we remain comfortable outside. The shade garden provides substantial habitat for wild life, resulting in built in entertainment (especially for Harry, the cat), constantly luring us outside to see what's happening. Early morning coffee and evening cocktails in the gazebo are punctuated by lunch and dinner on the patio. An impressive array of wild birds provide non-stop action at the feeders from sun up to sun down. Dusk brings brown bats picking insects in mid flight and flying squirrels sneaking seed from the bird feeders. We've learned to mostly cohabitate with the chipmunks, squirrels and rabbits - except for the summer of '16 when we were positively over-run with the little devils and found it necessary to relocate a few dozen! 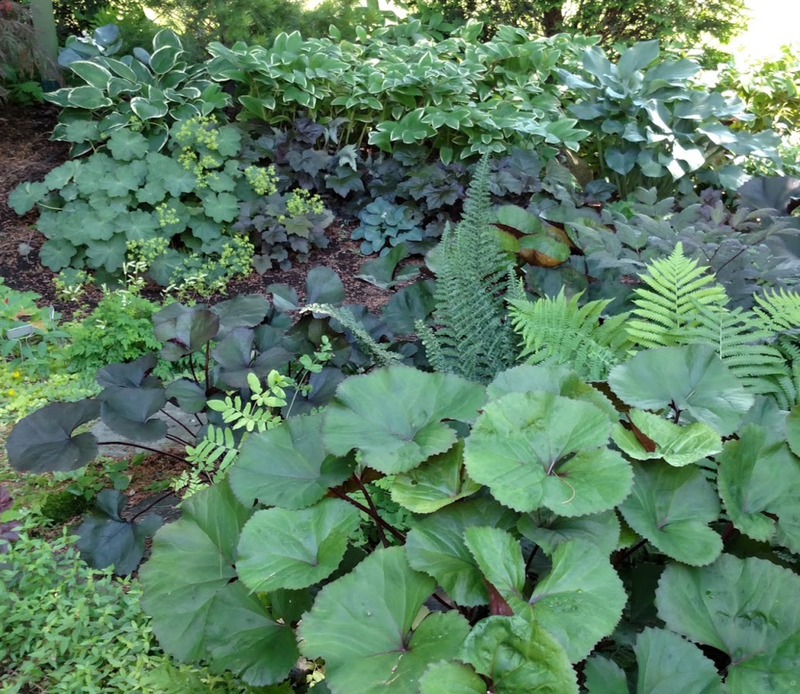 Shade gardens are the sophisticated foil to the flamboyant sun gardens. 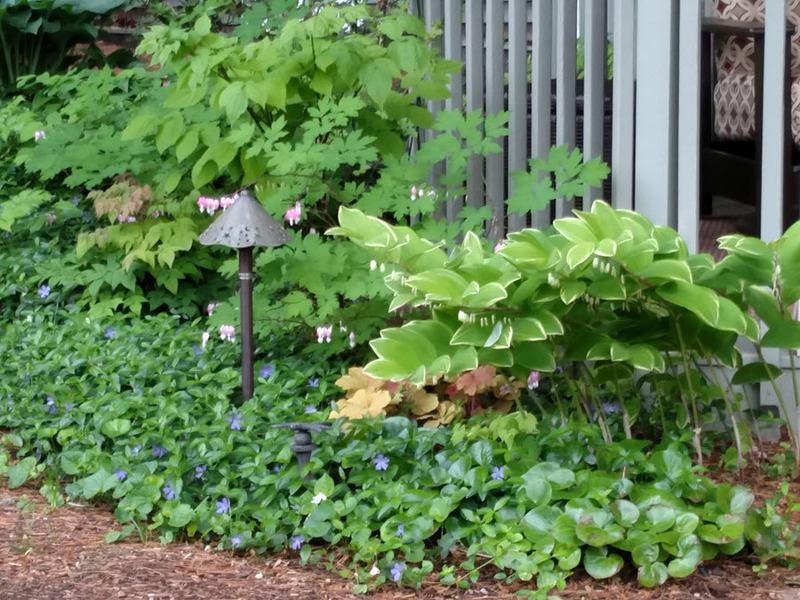 The gallery below is proof that many plants thrive in light to deep shade. 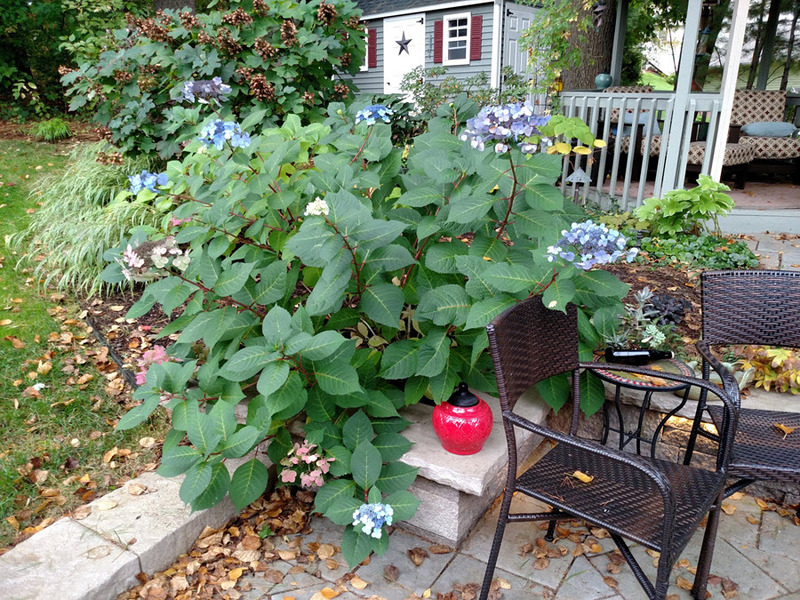 In fact, it's actually easier to keep plants looking healthy and happy in shade than it is in sun! 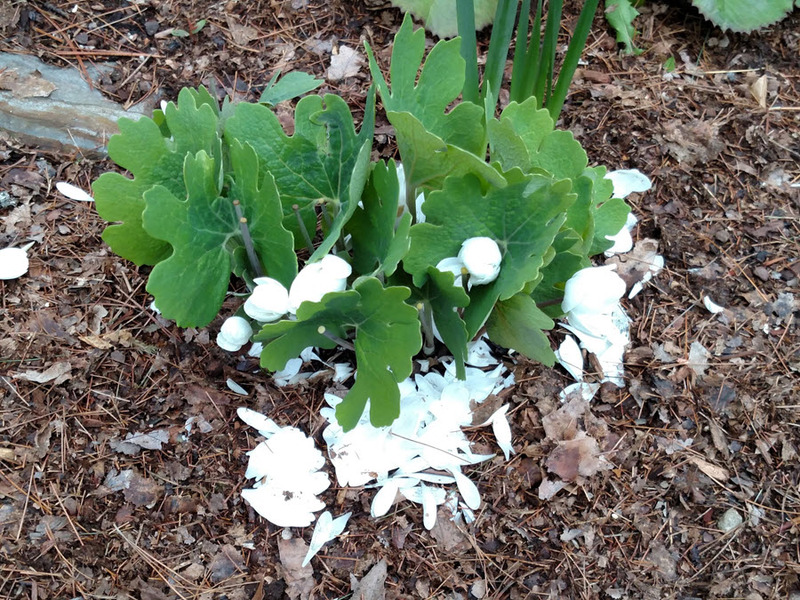 My shade garden is the first to wake up in early April, before the deciduous woodland trees leaf out. 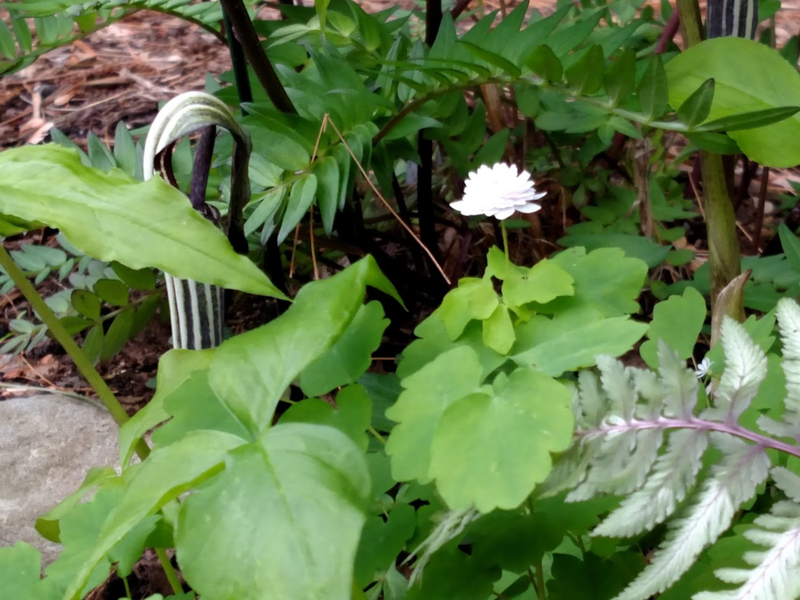 Gallanthus, epimedium, uvularia, anemonella and hellebores are the early risers, along with the spring ephemerals bloodroot, celadine poppy, European ginger, and jack-in-the-pulpit. 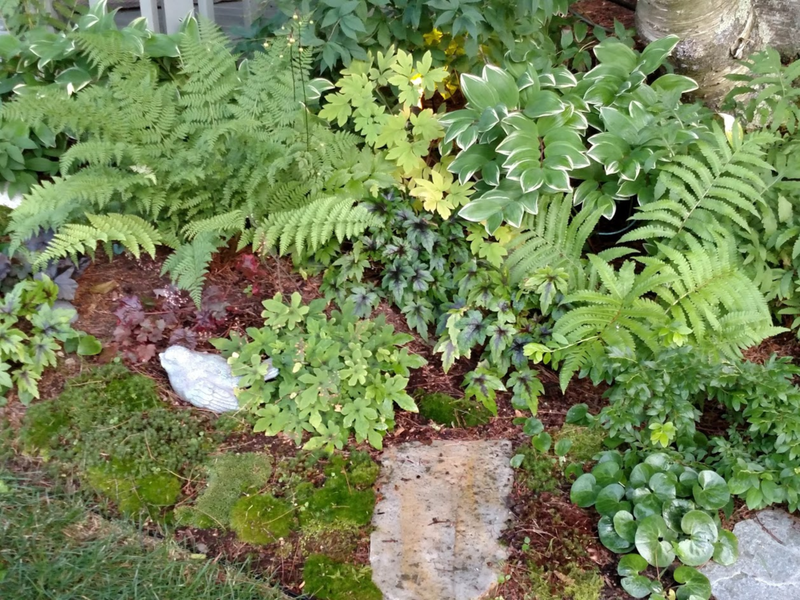 Next, come the broad leaf hosta, heuchera, solomon's seal and ligularia which hold their own right up until frost. 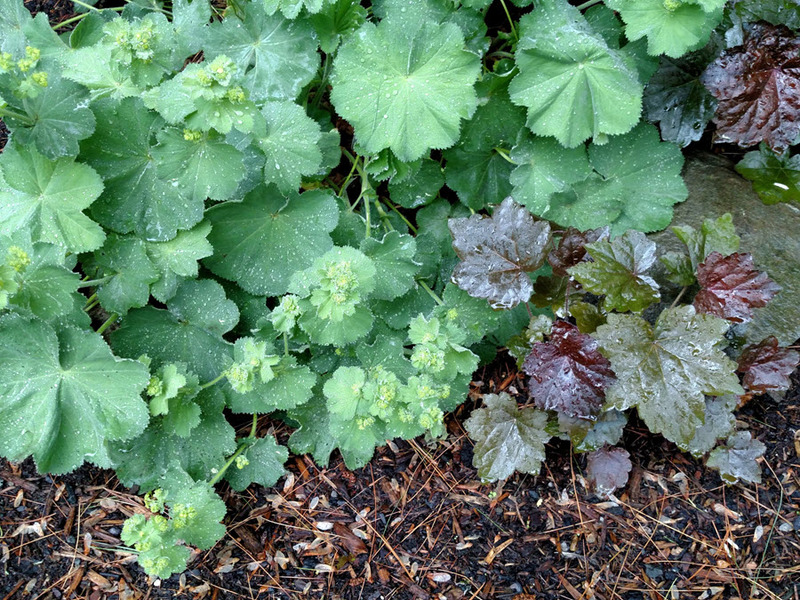 Delicate foliage and bloom are found in the ferns, bleeding hearts, ladies mantle, brunnera, tiarella and ground covers. The soft emerald green of the moss garden lends an extra layer of interest and softening. The resulting tapestry of foliage and delicate flowers is captivating and lends just the perfect setting for outdoor relaxation. 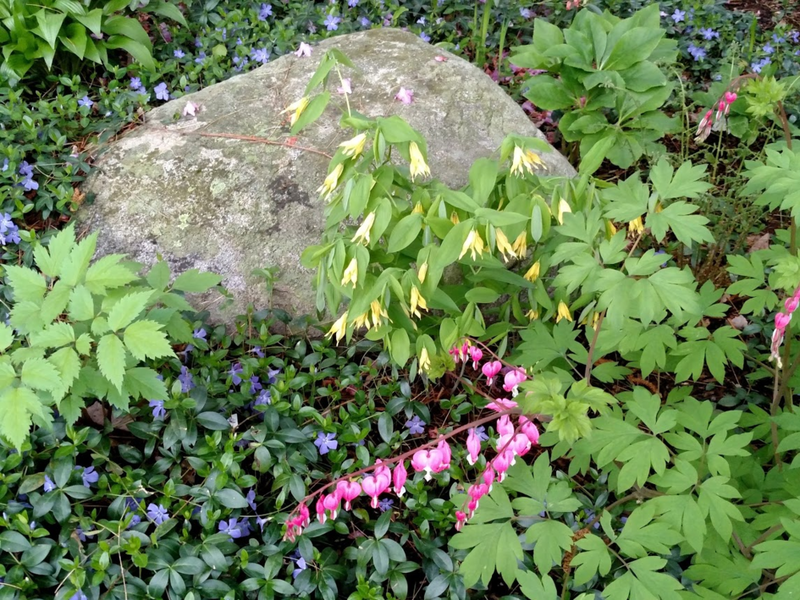 Blooms take a back seat to foliage, but still, something is always emerging and seeking attention, just in a more subdued fashion. If I were forced to choose only one type of garden for our property, it would definitely be shade. 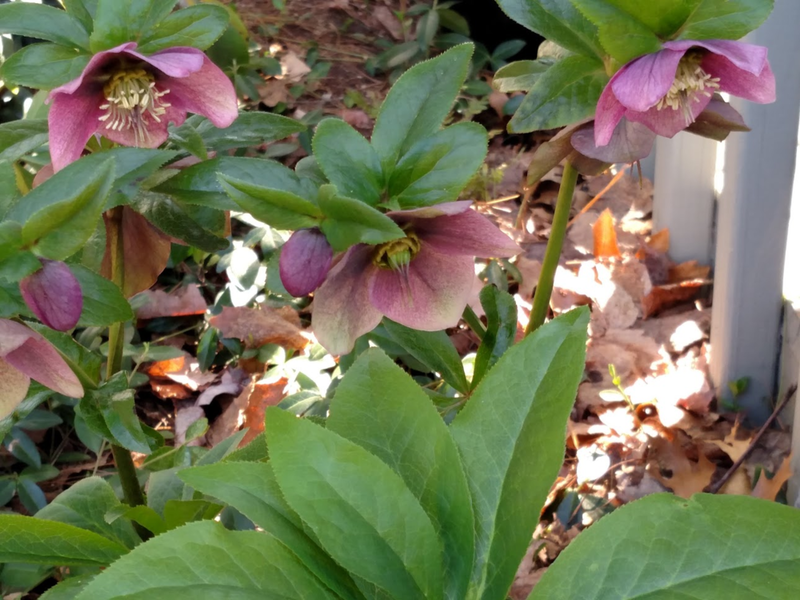 Shade garden photos show progression of foliage, bloom and color throughout the seasons. Click any photo for more information.